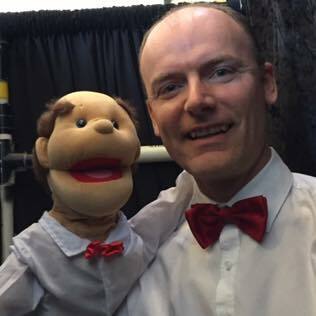 Brief: a puppet show for a Children's church on the theme 'God is Awesome"
Note: where possible, the puppeteer for ‘Onlooker’ needs to look/dress similar to each other. Bragger 2: Wow, it's dry out there, it hasn't rained for weeks! Bragger 1: You know, the God I believe in is so awesome He can make it rain ANY time He wants to. Bragger 2: Yeah, well MY God is so awesome He can make it rain any time He wants to AND can also make fire come down from the sky. Bragger 3: Really? Well MY God is so awesome He can make it rain any time, bring fire from the sky AND make the sun stop if He wants to. Bragger 4: Well MY God is so awesome He can make it rain water or fire, stop the sun AND cause the stars to fall. Bragger 5: My God is so awesome He can not only make it rain water or fire, stop the sun and cause the stars to fall, but He ALSO created this whole earth... [smugly] just by speaking!